Josie's Juice: New Year's Travel Resolution - "Don't Be A Jerk"
Are you travelling a lot this year? Lucky you. How about you quit the attitude? Okay, obviously I don't know what kind of traveller you are but according to this piece in Huffington Post, there's a good chance you're a nice person in your 'normal' life - and a tad nasty when footloose, fancy-free and on the road. Here's a New Year's resolution we can probably all agree on: Don't be a jerk when you're on the road. 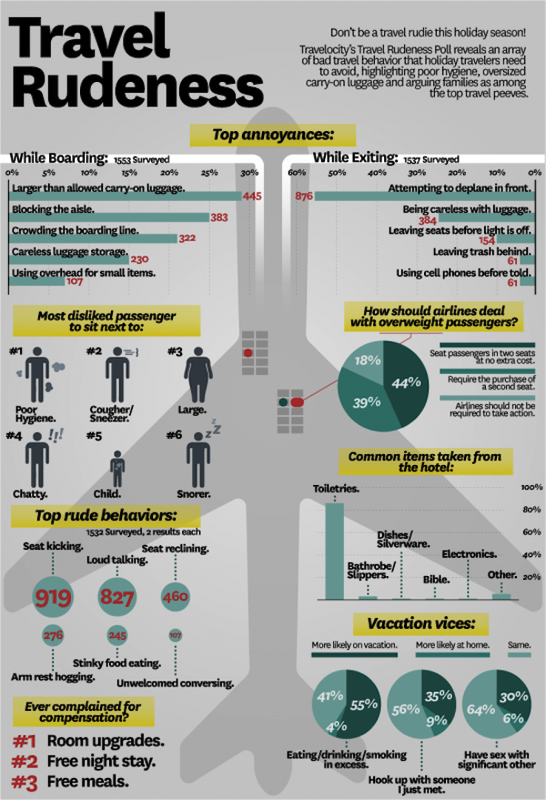 There's something about travel -- whether you're flying, driving or sailing -- that brings out the jerk in all of us. Like the guy in seat 26B just in front of me right now on a flight from Honolulu to Los Angeles, who is probably a nice guy on the ground. But put him on a plane, and shortly after takeoff, he jams his seat into my knees without so much as an apology. What do you think of this 'phenomenon' - and what are you like as a traveller? Here is a diagram from the site 'Travelocity' on their 'rudeness poll' - what are you guilty of?